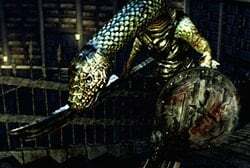 Man Serpent is an Enemy in Dark Souls and Dark Souls Remastered. Enemies are hostile creatures that respawn when players rest at a Bonfire or upon death. Special enemies that do not respawn are classified as Bosses, Mini Bosses or Invaders. Man-Serpents are large reptilian humanoid creatures that serve as the guardians of Sen's Fortress and Seath's Dungeon. They use heavy weapons and shields, and they may bite during combat. The melee fighters are typically slow, but hard-hitting. Time your parry carefully so as not to swing during their long wind-up, then riposte them, or circle-strafe them during combat for an easy backstab. Alternately, using a greatshield or a hard hitting weapon like a great club or great axe can stagger them. This is not advised though, as they have absurdly high poise and stability. Slightly weak to fire. Doesn't trigger traps. Man-Serpents are described as the descendants of dragons. Serpent Mage is an Enemy in Dark Souls and Dark Souls Remastered. Enemies are hostile creatures that respawn when players rest at a Bonfire or upon death. Special enemies that do not respawn are classified as Bosses, Mini Bosses or Invaders. A cobra-headed variant of the soldier. Snake-Headed Magi cast lightning magic and have four arms, three of which hold flamberges. This type also has a powerful bite attack that engulfs the players head and can destroy characters with low Vitality. Roll under the mage's lightning and engage them with melee attacks; they rarely counter with physical attacks in time to be a threat. (Weak versus lightning?). Though watch for poison spit and very devastating melee attacks (bleed builds up quickly) if you let them swing and hit. Lower poise than the warrior variant, easily stunlocked at melee range, even with slow weapons. The lightning they cast is actually magic damage so it is recommended to bring a magic resistant shield. The man-serpents in Dark Souls originated from the man-serpents in King's Field IV. While almost identical in appearence, in King's Field IV they are notably smaller, being not much bigger than the player. The video below shows them in their fortress in King's Field IV, which likewise is also filled with traps and narrow pathways. I wish the child version of a Man-Serpent was mentioned. 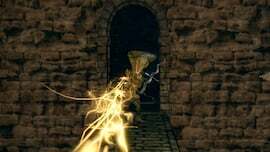 In the entirety of Dark Souls 1 (and basically the entire Dark Souls Series, Bloodborne does not count) the child Man-Serpent that turns on that creepy music when you first leave your cell in the Duke&apos;s Archives Prison is the only child we ever encounter. There are no children in Dark Souls 2 (there could have been if they didn&apos;t remove the child version of the Emerald Herald) and no children in Dark Souls 3 afaik (Anri does say "for the children I once knew" at one point which was kind of heartbreaking).